Timmy has a birthday, and all his friends have come to celebrate with him - Silly Sally, the lion and lioness and the goblin. 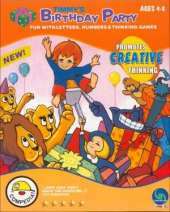 Everyone has brought a gift, and as Timmy unwraps each gift, he finds a multitude of fun and amusing surprises and highly interactive activities: Motion puzzles, Building games, Thinking games, Full painting workshop. All these fun activities provide positive reinforcement throughout the program allowing children to play at their own pace and improve important learning skills. This innovative activity center is based on the characters from the magical interactive world of the Timmy series written by award-winning author, David Grossman. Educational Goals: Fun letter & number games; Improves creativity & imagination; Logic & quick thinking skills; Problem solving skills. Features: Highly interactive; 13 different activities; Full painting & printing workshop; Multiple levels of play.